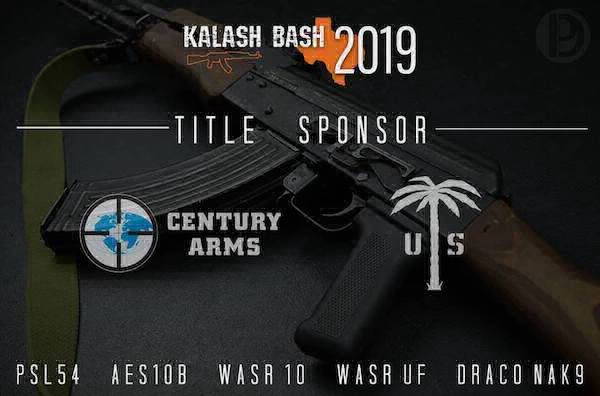 DELRAY BEACH, Florida - - Century Arms, North America’s premier AK manufacturer, invites shooting enthusiasts to Navasota, Texas this weekend, April 13-14, for Kalash Bash, an 8-stage competition exclusively for the AK platform. Produced by Khyber Customs, Kayco47 and Dissident Arms, the sold-out event takes place at the CCC Shooting Complex where 300 participants will compete over two days on a demanding course of fire requiring speed, finesse and accurate shooting. Century Arms is providing a PSL rifle and Red Army Standard ammunition for a featured stage challenge along with a variety of firearms as prizes for top finishers including an AES 10-B, WASR and Draco. U.S. Palm will also be on hand with prizes and giveaways. The public is welcome to attend and watch the competition, view demonstrations, shop vendor booths and enter contests and giveaways. “Karnival” fun stages will be set up for general admission attendees to try an AK rifle and participate for prizes. Concessions will be available and parking is free for the event. A 2-day general admission pass is $75. All attending Kalash Bash are invited to stop by the Century Arms booth to try a variety of products including the 2019 VSKA AK rifle, PSL and NAK9X. For attendees interested in their first AK or getting the most from their current rifle, staff will be on hand to answer questions. For additional information on Century Arms, visit us online at centuryarms.com.